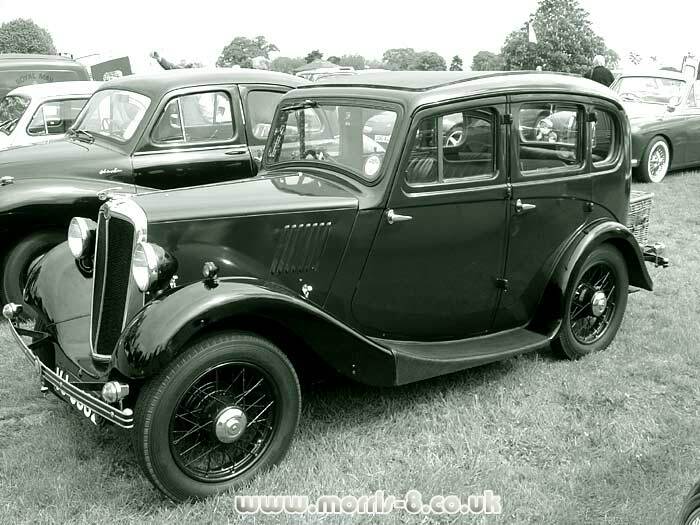 The Morris 8 motor-car of 1934 onwards. The new 8hp Morris took over as Morris Motors' small-car offering in late 1934, following in the tyre treads of the outgoing Morris Minor, a car introduced in the late 1920s as a response to the runaway success of Herbert Austin's hugely popular 7. The 8's engine was a sidevalve four-cylinder unit of 918cc, employing a three-bearing crankshaft and pressure lubrication, coupled to a three speed gearbox. Fuel was supplied by an electric SU pump, feeding a small carburettor of the same make. The new 8 made its public debut on Stand 109 at the Olympia Motor Show of October 11th - 20th 1934, right alongside the Austin Motor Company (stand 108) and the Birmingham Small Arms Company (BSA) on stand 110. The 1935 Morris 8 was available in the UK market as a saloon, or as a tourer, and both were fitted with a smart chromium-plated radiator surround, and spoked wheels. Cheapest was the Two-Seater for which Sir or Madam would be relieved of 118 GBP, while the top-of-the-range four-door saloon, with leather trim and opening sunshine roof, would cost 142 GBP. The Tourer cost 120 GBP, as did the Two-Door Saloon with fixed head, while the sliding head version of the Two-Door was listed at 132:10s, and the Four-Door fixed head at 130:00. Bumpers and indicators would add another 2:10s to the list price, and most cars seem to have been so equipped when new. 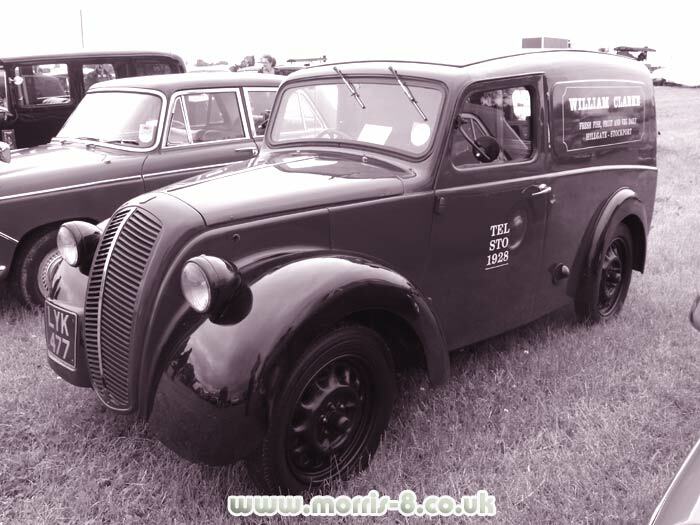 Compared to the Austin 7 and the Ford Model Y, the Morris was really quite well-equipped. While the Austin and Ford made do with cable brakes, the Morris employed Lockheed hydraulic brakes to all four corners, something introduced in the final Minors of mid/late 1934. For some reason, Morris fitted the 8 with a three speed gearbox, while the outgoing Minor was available with a four-speeder. Morris 8s for sale, and related parts. Ending soon, a variety of auctions that will be of interest to owners and restorers of these compact pre-war cars. Please call by regularly to see the latest items available to bid on. 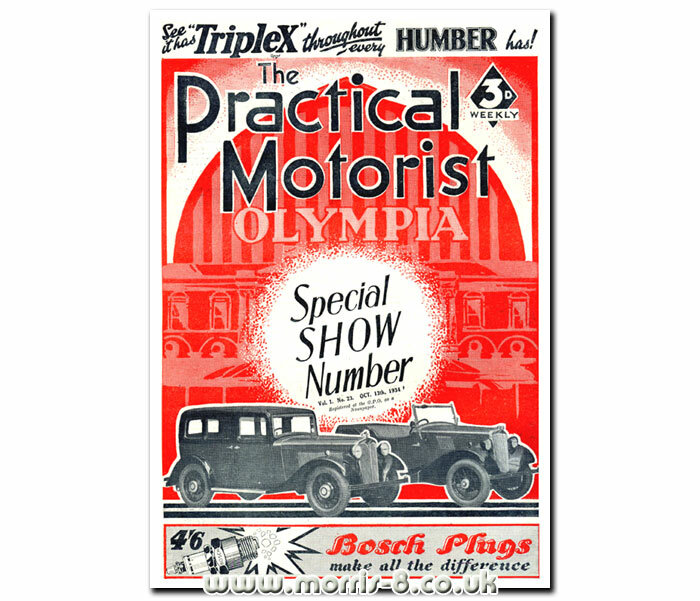 The copy of Practical Motorist shown below features both the Morris 10/4, and the new 8, on its cover in October 1934. Series 2 Morris Eight is launched. The car would continue being produced in this form until 1938, when the revised Series 2 Morris 8 took over from what was then retrospectively known as the Series 1. The Series 2 featured updates to the original design, rather than a wholesale re-working. The chrome-plated radiator surround was replaced by a painted affair, in line with developments made to the Morris 10 and 12. The spoked wheels of the Series 1 were ditched in favour of Easiclean rims. The remainder of the car continued along the lines of the earlier variant, still utilising the dependable 918cc engine under its bonnet. Enter the Series E and 5cwt Z van. 1939 would see a major shake-up in the Morris 8's design, with the introduction of the Series E. Gone was the upright radiator grille and exposed headlamps of the Series 1 and 2, replaced by a streamlined grille, and lamps incorporated within the fuller front wings, echoing the interest that was now being shown in wind-cheating, more aerodynamic designs. Gone too were the running boards, hinting at how the design of car coachwork would progress once WW2 had been fought. The Series E's engine received a number of useful updates, endowing it with 29bhp and improved bearing materials. Saloons and tourers were offered prior to the war, but afterwards only the saloon continued in production at Cowley. Van versions of the Morris 8 had been offered from the early days, and following the introduction of the Series E, a new 5cwt light commercial called the Z van, employing similar front-end styling to the E was put on sale, many of which found their way into the Post Office/GPO fleets. The van version of the Morris 8 continued in production long after the Series E had been replaced by Issigonis' "low light" Morris Minor MM of 1948, finally bowing out in 1953. I owned a van for a while, and it had one of the sweetest-running engines I've owned. Buying and restoring an "8" today. Buyers today choose the Morris Eight as a reliable and comfortable pre-war car, well-specified by the standards of the day, and well served by owners' clubs and specialist suppliers. As an interesting, and some might say, superior offering to the Austin 7, the Morris Eight has a lot to recommend it. Many examples survive in preservation, both in the UK and overseas (Australia especially, where a variety of locally-bodied utes and tourers were also offered). The separate chassis enabled many examples to soldier on in regular use right through the 1950s and 1960s, although the introduction of the Ten Year Test (MOT) in the early 1960s did remove many of the poorest examples of most pre-war cars from the roads. Restorable project cars still turn up quite regularly. Rot can be found in the sill areas, where the rear wings bolt to the main body tub, and along the lower rear panel and boot floor. The worst examples can also demonstrate severe corrosion beneath the rear seat squab and in the door posts, but with patience, adequate funds and a modicum of skill, all but the worst examples can usually be restored to roadworthiness once more.